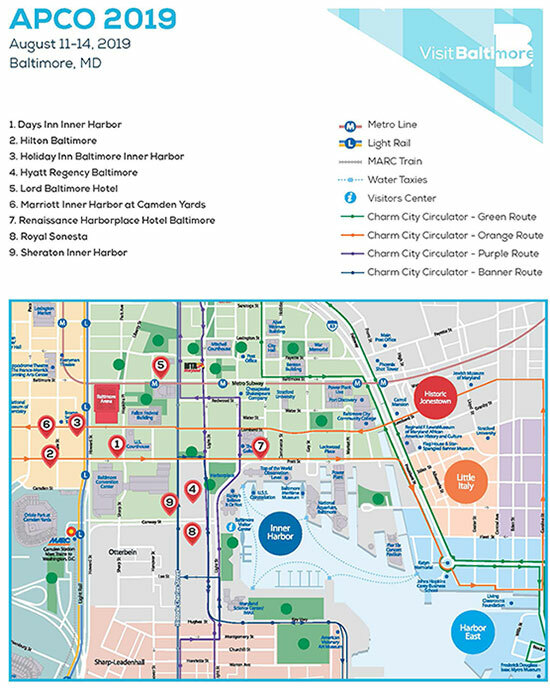 APCO International has negotiated special rates for conference attendees at various Baltimore hotels. To take advantage of the discount, you must make reservations through the APCO 2019 website, using our designated housing provider, Orchid.Events. Hotel reservations are taken on a first-come, first-served, space-available basis. Submit your request as soon as possible for the best opportunity of receiving your hotel choice. Shuttle buses will run between the Convention Center and select conference hotels. ADA buses will be available by request between all hotels and the convention center. Book with the individual attendee housing form. Orchid.Events will send reservation acknowledgements within 24 hours via email if booked online or by telephone. If you do not receive your acknowledgement in this time frame, contact Orchid.Events. Cancellations after July 12, 2019, will be subject to a $50 processing fee. One night’s room and tax will be forfeited entirely if cancellation occurs within 24 hours of arrival date. Through July 12, 2019, send requests for changes and cancellations in writing to Orchid.Events via e-mail (help@orchid.events) or fax to 801-355-0250. After July 12, 2019, contact hotels directly to make changes and cancellations. For questions or special requests, please contact Orchid.Events at 877-505-0684 or e-mail questions, cancellations, or changes to your reservation to help@orchid.events. Special requests are not guaranteed. Hotels will assign specific room types upon check-in, based on availability.